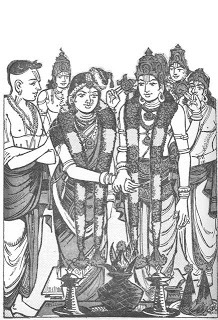 Being pleased after thinking about the benefits he received (emperumAnAr’s grace), he wants all to become devoted (to emperumAnAr) in the same way, and for that he talks about emperumAnAr’s graceful help to this world, emperumAnAr who is the target of ANdAL’s grace, ANdAL who is the desire of emperumAn. 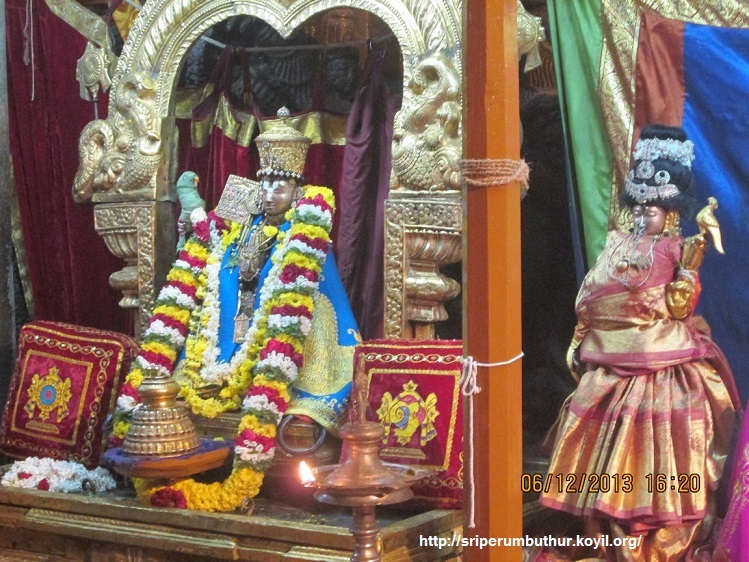 In the previous pAsuram, he celebrated emperumAnAr through his devotion to periyAzhvAr; in this pAsuram he talks about that AzhvAr’s daughter ANdAL’s natural compassion which emperumAnAr is living with, and his (emperumAnAr’s) nature being of extreme generosity, due to which he is constantly deliberating about giving paramapadham to everyone; when all of the ways of vEdhas were lost, and when kali (its ill effects) was spread everywhere and was ruling the world, he came from the other world to this soil and saved everyone, he is such a beloved one; and he (amudhanAr) wants everyone to be involved in that person, so he is explaining about the help of emperumAnAr. Implication is, like me shouldn’t you too live relating only to him (emperumAnAr) and to nothing else. sUdik koduththavaL – in her divine hair, as can be referred as ‘thAzh kuzhalAL’, first she decorated herself with that garland, and then removed it for presenting to the swAmi. As this happened, she was named ‘sUdik koduththavaL’ (~one who wore and then gave), and then that itself became her identity (her name is not mentioned in this pAsuram); like also said in ‘sUdik koduththa sudark kodiyE [thiruppAvai thaniyan]’. so, as she is the mother for all in these worlds, due to that motherly relationship, she is naturally merciful. vAzhginRa – by her mercy only, you see, is his well-being. When emperumAnAr performed charaNAgathy (surrendering), when azhagiya maNavALan had given sERththi (together) with srI ranga nAyakiAr in her sannidhi, he started with ‘bhagavan nArAyaNAbhi mathAnu rUpa [gadhya thrayam]’, it is famous that he performed prapaththi at Her divine feet first to begin with. enRum mAmuni – as he is this much generous, he is always deeply deliberating about the protection of his devotees. irAmAnusan – that is, emperumAnAr. thAzhvu onRu illA maRai – vEdham not having any deficiency is about – bramam (mistaking one for other); pramAdham (forgetful); vipralambam (contradictions), etc. ; purushapraNIthathvam (being created by someone); svaprAmANyE anya sApEkshathvam (having to refer to something else as source); anithyathvam (not existing at times/not lasting); and so on – none of these deficiencies are present in vEdhas. maRai thAzhndhu – such vEdham got affected badly due to bAhya kudhrishtis (those not accepting vEdhas, and those giving wrong meanings to vEdhas), and due to the nature of kali yuga; kali cramped and tried to destroy the vEdha; (this is explained in length quoting vishNu purANam and srImath bhAgavatham); due to the badness of kali, it was walking in ways that should be rejected, and cornered and side tracked the vEdham. thala muzhudhum kaliyE ALginRa nAL – Like how when light is hidden/removed, the darkness would surround and occupy the whole place, by the nature of this world that brings in darkness (ignorance), kali yuga was ruling alone this world; if time and place are right and amicable, then it would be possible to correct and protect; unlike that, the place was having multi-faceted enemies (of vEdhas), and time belonged to such people (so it was hard). aLiththavan kANmin – he came so and protected everyone, please see! Meaning is that, all of you please understand that he is your protector, so surrender to him and live right. AzhvAr too said, ‘kaliyum kedum kaNdu koNmin [thiruvAimozhi 5.2.1] (~ Watch for it! kali’s effects will be destroyed!’). arangar – unlike in his other pAsurams where he says ‘arangan’, here he says ‘arangar’ -> similar to ANdAL using the word ‘arangar’ during praNaya rOsham (upset with emperumAn due to separation). This is followed by very detailed descriptions about emperumAn’s love for ANdAL, greatness of ANdaL, greatness of emperumAnAr due to his considering thiruppAvai as an upanishath, and getting the name of thiruppAvai jIyar, how emperumAnAr removed the darkness created by kali, and so on. This entry was posted in iyaRpA, rAmAnusa nURRanthAdhi and tagged 4000, andal, azhvar, azhwar, dhivya, divya, english, introduction, iramanusa, jeeyar, jIyar, kodutha, koduththa, meanings, naalayira, naalayiram, nachiar, nurrandhadhi, nurranthadhi, nutrandadi, nutrandhadhi, nutranthadhi, prabandham, ramanuja, ramanujar, ramanusa, soodi, thayar, thiruvarangathu amudhanar, vyakyanam on November 12, 2015 by raghuram.